Bereket Simon and Tadesse Kassa. 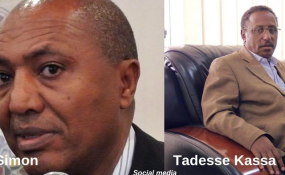 The police have arrested founding member of the ruling EPRDF and veteran politician Bereket Simon, and former TIRET Corporate CEO, Tadesse Kassa, A.K.A. Tinkishu, the Amhara Mass Media Agency reported. They are detained on suspicion of wasting public money when both were running TIRET Corporate, a conglomerate owned by the Amhara Democratic Party (ADP). On August 24, ADP suspended both from its central committee membership and said they were being investigated for inappropriate conducts in running TIRET.